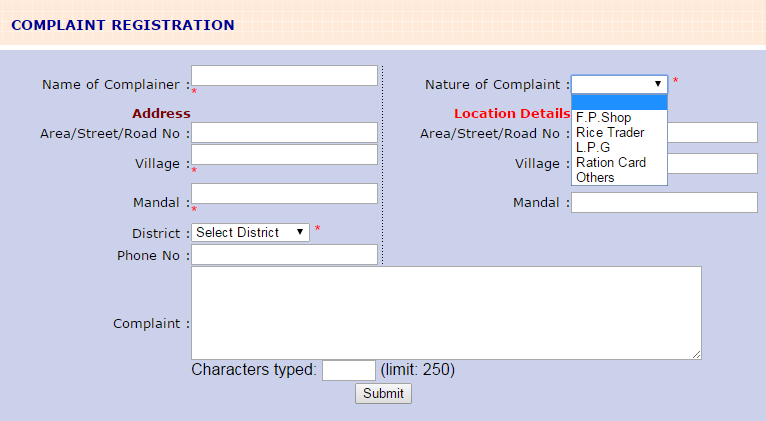 Government of Telangana provided Complaint Registration in online about Ration Complaint, L.P.G Complaint, F.P.Shop, Rice Trader Complaints and other. Ration cards are intended to provide essential subsidized commodities to below poverty line,above poverty line and Antyodaya families hence it is helpful to save money through procurement of essential commodities at a subsidized rate.And we know a copy of ration card is used as a proof of identification in the process of applying of sim card, bank account and Domicile Certificate etc. It is quite natural we may experience delay in availing original ration card once we done the process of ration card enrollment, Fair Price Shops need to be dutiful if not the ration card holders might not get raw food items and fuel intended to provide them like wise we experience same issues from rice traders and L.P.G distributes. Free Online Seva helps to you How to complaint about Ration Card, Consumer complaints on Ration Card and Government of Telangana provided Ration Card complaints in online. Are you facing problem in receiving original ration card or from Fair Price Shops, L.P.G, Rice Traders? For you to solve your concerns Government of Telangana taking complaints online from its official website. you can register complaint with any of the following subject. Once have a glance at below snapshots to get the process to raise complaint. Now we have a chance to complaint about ration card in online. My name is CH. Ravi kumar son of CH Jwalapathi resident of 4-35-29, Venkateswaranagar, Jagathgirigutta, Hyderabad-500037, Telangana state.My name got deleted from our Ration Card:365371069447 FMS Ref no: FMS508799781542 and My Aadhar No:662475084865 EID: 1111152880201720110609155602. My age is 32 years. But according to Ration card portal it is showing duplicate EID exists in Andhrapradesh. When we checked in AP Ration card portal we found the Ration card:RAP138200539534 of Kurnool district in which there is a person by name Ch Ravi kumar (s/o M.Siva Ramudu) with 1 year of age. And UID number:662475084865 EID:1111152880201720110609155602. How can there will be two persons.Please check on this.Even by checking last digits in EID 20110609155602 it shows Aadhar taken on 09/06/2011 Time:15:56:02.But how can the Ration card in AP :RAP138200539534 showing Ch Ravikumar with 1 year age with this Aadhar number. Kindly check on this and include my name in Ration card :365371069447 in Telangana state. Also please verify the details of Ch Ravi kumar (1 year age) in Ration card RAP138200539534 by checking his Aadhar card as this is Fake. Sir my ration shop no is down iam not getting the given goods. Instead of this the dealer is giving rin soap salt packet vermicelli packets vim bar and taking MRP rate 245 for all but this message is generating after taking the goods.plz take action. My name is Omana Varghese w/o Varghese Joseph,resident of 6-374, Plot No:19,MLR Colony Road No:3,Saroornagar, Hyderabad-500097, Telangana state.My Ration Card No: 365370284196 and My Aadhar No:678216525359. My shopNo; 1515017, Badampet. There for I request to you please take action against this kind of shopwala. My ration dealer Mr. Sinkesh was talking unparlamentary language for not getting minimum billing of 200 rupees. The rates are too high comparing General store. He says that if we not receiving the ration with minimum billing of 200 rupees he will deactivate my ration card permanennly. I am G AshokNaik, i was applied for my missng name through me seva, mro sir is approved my name but ration is not provide me.I meet mro officethey told contact dso office i am meeet two times so sir/madam busy,my details is 928538051354 &369300023112. Please verify and solve ASAP. any queries contact me. 8247515960. FP SHOP NO.209.The lady in the ration shop is forcing to take items for more than ₹300 else refusing to give any items.Also,there is no bill provided for items bought. Message sent to the mobile for items which are not bought. People are being fooled and there is no necessary action taken by any concerned authority. Appreciate if someone can look into this matter and take necessary actions at the earliest. i sm ashanker damavarapu FP SHOP NO 511 CIRCLE V. They are always close the shop. They Work as per their timing not as per Gov timing. When they are open there will be some server issue or ration no ration available. and more over they Give some OIL packet papad, chaipatti, salt which is must to buy without that they wont give rice. and the behavior is very rude. Kindly help us. SHOP no 511 Circle V langer house. which number gov provided toll free its the hole day busy aether first rang the phone then they are put on busy tone how can public react to government. My name is MD.Sharief.Shop no.179 he will open the Shop 6 pm 8pm. In month 10th to 15th. Otherwise you don't come to my Shop. My name is Ramesh lolam and my wife name is lolam saritha I have applyied in mee seva in 2016 regarding the ration card about my name and my wife name.then approved only my name and my wife name not approved it's showing deleted as magrited my wife name. after that my name also deleted please need your help to fix this issue.i go to mee seva again for apply new card then it's showing fsc number -fsc021600569105. Then I tell him to add member but showing same thing as fsc number . My aadar card number -298672846071. My wife aadaar card number -954860757640. Please fix this issue iam facing this problem since 2016. After deleted both my names in ration card then showing in mee save pleSe check i hope you understand my situation. Dear Talangana govt please issue my Ration card, i have applied one year 25/05/2018 back but till now not issued this is one example can say how govt is working today 20/03/2019 check the status still its showing inspector pending..
how the Telangana Govt working..! It's very Bad. My query is I applied new ration card 11-2-2019 after two month my status is rejected ASO why reason is not mentioned enquiry inspected submitted all documents meeseva no.is FSC021901994410 pleas issue my card telangana gov.